In a series that has been a back-and-forth affair so far it was Regina’s turn to have control in Game 4. The Pats came out of their offensive shell to beat Swift Current 6-3 and tie their first round best-of-seven series at two. Almost a dream start for Regina as they lead 2-0 and have outshot the Broncos 11-2 midway through the first period. The downside for them is Hajek appears to have been hurt on a hit by Anderson. Not sure how bad. Broncos need to string some shifts together now. had three power play assists but the #SCB get doubled up by @WHLPats 6-3 in Game 4. The first round series between the Pats and Broncos oddly had a break between the third and fourth games in Regina. That meant an extra day for the Broncos to hang out in the Queen City so colour commentator Andrew McCormack joked with Swift Current associate coach Ryan Smith about seeing the sites in Saskatchewan’s capital. He quickly shut that down saying “this isn’t a field trip” and it was all serious business for the eventual WHL Champs. Would a day off slow Swift Current’s momentum and give the Pats a chance to respond? Both teams hit the ice for practice with questions looming about their injured players. The Broncos had really asserted themselves in Game 3 and Regina would need an answer. What tricks did veteran coach John Paddock have up his sleeve to achieve that in Game 4? We will find out tomorrow! Meanwhile, the Prince Albert Raiders had Moose Jaw on the ropes in their Game 3 up 4-2 late before Moose Jaw came back to win the game in overtime. The battle between the other two East Division teams was closer than anticipated. 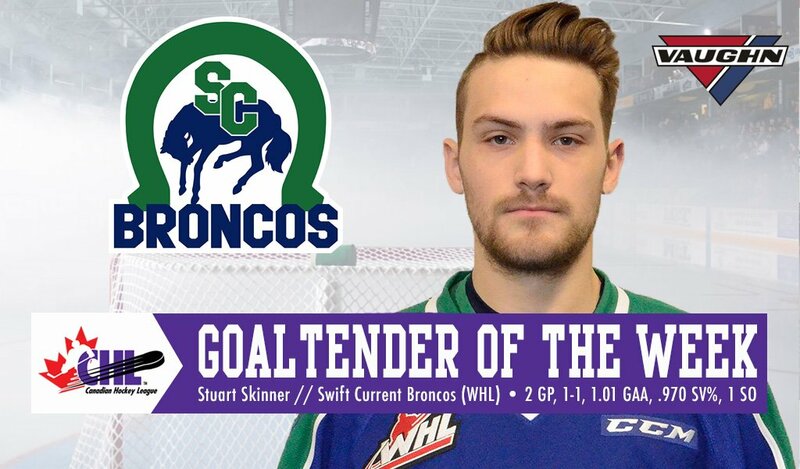 Stuart Skinner made 39 saves as the Swift Current Broncos beat Regina 4-1 to take a 2-1 lead in their first round WHL playoff series. Skinner has now stopped 101 of the 104 shots he has faced in the series. Glenn Gawdin led the way offensively with two goals and an assist, while Tyler Steenbergen added three helpers and Giorgio Estephan had two. There’s #WHLPlayoffs action in the Queen City tonight. Get excited. March 25th, 2018 was a travel day for the Broncos as they headed off to Regina with Game 3 on their minds. The series started with two hotly contested games between two rivals who had almost identifcal records in the second half of the season. Regina earned a split on the road to steal home ice advantage. The Pats had to play without second half starting goaltender Max Paddock and deadline addition Jesse Gabrielle, while the Broncos lost top defenceman Artyom Minulin to injury during Game 1. That made a veteran with playoff experience like Sahvan Khaira all the more important. On Swift Current Online we had a story on Khaira’s ability to elevate his game come playoff time. Sahvan Khaira seems to thrive when the heat is really on. The Swift Current Broncos defenceman made his name during last season’s playoffs as he was incredibly difficult to play against in their battles with Moose Jaw and Regina. Khaira had scouts buzzing in the playoffs last season and has already brought that hard-nosed style of game to the playoffs in a split against Regina in the first two games of this season’s first round series. Both teams have made physical play a priority in the early going. That’s something Khaira predicted before the series and something he believes they can do to slow down Regina’s skilled players. Back tomorrow with Game 3 from Regina! Cameron Hebig scored twice and Ryan Kubic made 32 saves leading Regina to a 2-1 win over Swift Current in Game 2 of their first round series. The Pats battled hard to get the split every road team desires at the start of a best-of-seven series. “That’s the loudest I’ve heard our rink since I’ve been here. The fans where at times a 7th man for us”. The Swift Current Broncos were looking for playoff experience when they added Stuart Skinner from Lethbridge at the trade deadline. The veteran delivered with 34 saves for the shutout as the Broncos beat Regina 3-0 in Game 1 of their first round series. With no playoffs for the rebuilding Broncos this season, I thought it would be fun to kind of re-live the playoff run from last season day-by-day as a fun look back to what was a very exciting spring. We all knew this season was going to be a whole lot different after all the moves made to get stronger for the championship run. I’m sure most fans expected to be sitting out the spring. While we all understand it, why not take a quick look back throughout the spring to remember what the run was like? The most anticipated WHL series in the first round of the playoffs paired the loaded up Swift Current Broncos and the Memorial Cup host Regina Pats. Regina, Swift Current and Moose Jaw had almost identical records after a trade deadline that saw both the Broncos and Pats really load up their rosters with depth and star level talent. The fact that the two clubs were meeting in the first round of the playoffs created a lot of conversation on the WHL playoff format. One of the best teams in the WHL was going home after the first round. It was also a re-match of a seven-game battle in the second round of the 2017 playoffs that saw Regina erase a 3-1 deficit to advance over their rivals. The Pats had also knocked the Broncos out of the 2015 playoffs, had elmininated the Lethbridge Hurricanes (featuring Stuart Skinner, Giorgio Estephan & Tanner Nagel) two seasons in a row and had knocked off the Calgary Hitmen (featuring Matteo Gennaro, Beck Malenstyn & Andrew Fyten) in the playoffs as well. Swift Current had some redemption on their minds!